Baked Parmesan Crusted Pork Chops : Serve these parmesan crusted pork chops to your family for dinner. You’d never know they’re baked and not fried! It’s our all-time comfort food favorite my boys ask for over and over again. Last week, I surprised my family with Baked Parmesan Crusted Pork Chops. It’s a family favorite recipe that I’ve been baking for as long as I can remember. And every time I bake them, they are devoured. My family just can’t seem to get enough of this one! I was raised on fried pork chops, so I know a good chop when I taste it. And this one taste just like it’s been deep-fried, for sure. However, it’s baked–not fried. With a buttery crust and a little grated parmesan cheese, these juicy chops would be a wonderful choice for your next family meal. Just like all my other Southern style meals, I like easy. And these pork chops are simple to throw in the oven and bake. I like to serve mine with another Southern favorite–fried okra. So it’s nice to have a baked version for this one. The secret to delicious baked parmesan crusted pork chops is the crushed buttered crackers. After blending the crackers with grated parmesan cheese and salt and pepper, I like to double coat the pork chops, too. That way you get an extra crunchy layer on the outside of the pork chops once they’re baked. 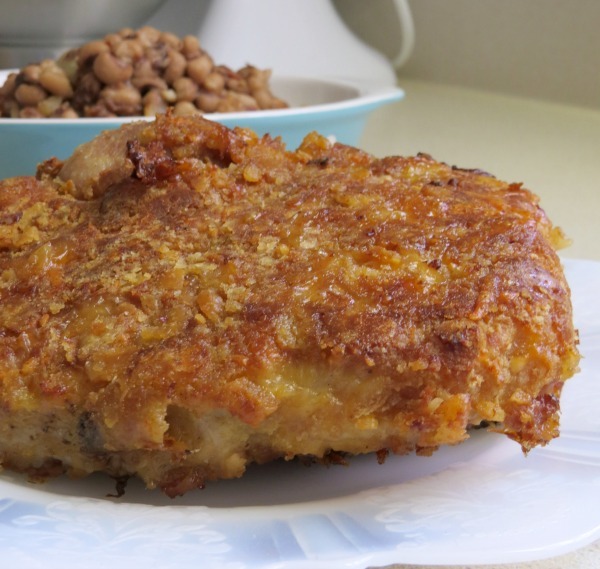 No kidding- these baked pork chops really do taste like southern fried. Place 1/4 cup butter in the baking dish and melt in oven. Combine cracker crumbs, parmesan, and salt and pepper in a shallow bowl. In another bowl, blend together milk and eggs. Flip pork chops in cracker mixture, then milk mixture, and once again in crackers for a nice buttery crust. Take out baking dishes and swirl around melted butter evenly across the bottoms. Place coated pork chops in baking dish for 30 minutes. Using a spatula, carefully flip each pork chop and continue baking for another 30 minutes or until chops are done. Have you tried Crock Pot Cheeseburger Sandwiches? After so many years of baking these, I’ve learned using a Clear Oblong Baking Dish works best. Other varieties seem to stick a little, even with butter. But the clear glass, for some reason, never sticks. I also use 2 shallow baking dishes because I make so many, and to give enough room between each chop for flipping during baking. Now I know what you’re thinking. That’s way too much trouble! And yes, I get it. But believe me, these baked parmesan crusted pork chops are so worth it. I don’t think my family loves any other recipe I serve more than this one. It’s a comfort food favorite that my boys ask for over and over again. You don’t want to miss this one, so grab a copy to keep on hand for later. Just scroll to the bottom of this post to check out a printable version of this pork chops recipe. Print it out or bookmark the page so you don’t forget. 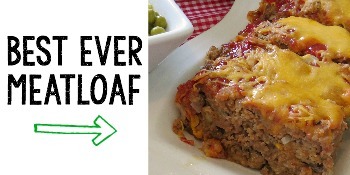 Check out this recipe for the Best EVER Meatloaf! 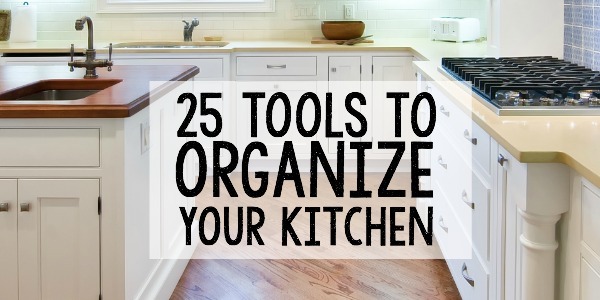 *I use 2 shallow baking dishes and 2 shallow bowls for this one. Place 1/4 cup butter in each of the baking dishes and melt in oven. This sounds wonderful! 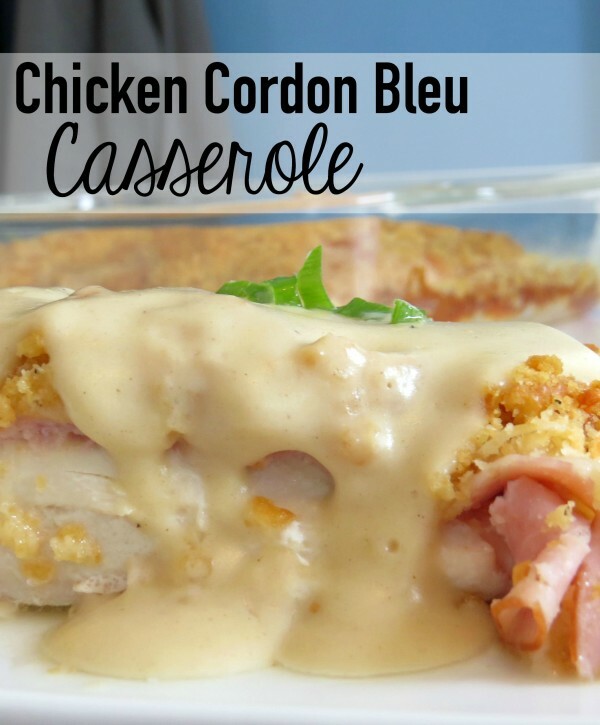 I just tried a similar recipe on chicken tenders and my whole family loved it, so I’ll try yours next. We eat a lot of pork and I’m always looking for new ways to serve it. I just bought some pork chops. This would be a great way to serve them. Thanks for the recipe and Thanks tons for linking to Inspire Me. Yummy! 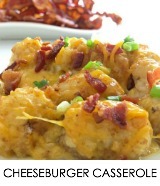 I am going to make this soon! Pinning for later. Make sure you stop by and join us for Tickle My Tastebuds Tuesday! You had me at butter-crusted. I am always looking for ways to spruce up pork chops. Nice recipe! 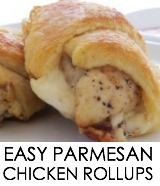 These look so good, I sometimes will use Wheat Thins or Chick n Biscuit to coat chicken, or fish. No seasoning needed. And thanks for visiting Weekends Are Fun, I have Pinned your post from your blog. I’ll be honest, I don’t usually like pork chops because they always seem so dry and flavorless. But these looks so incredible that I will be trying them next week! Thank you so much for linking up at Tasty Tuesday! Your recipe has been pinned to the Tasty Tuesday Pinterest board! Please join us again this week! 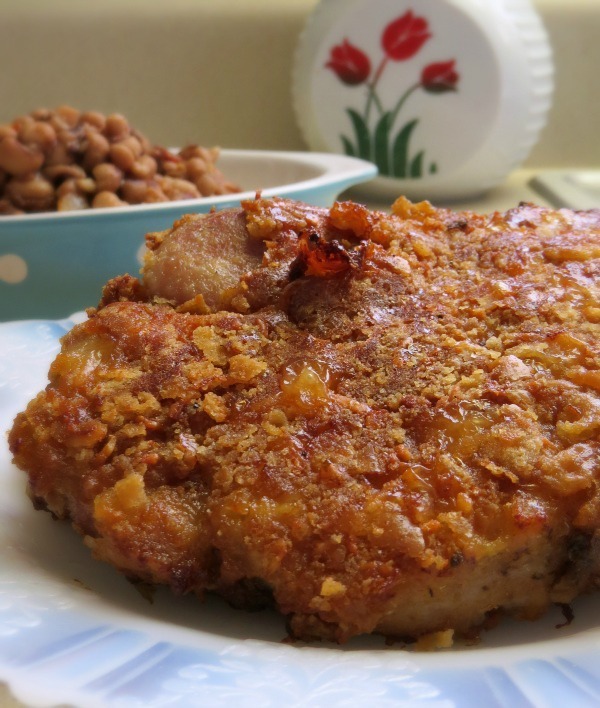 thanks, Stephanie– I love linking with Tasty Tuesday– and these pork chops are never dry–that’s why I love this recipe! Stopping by from Turn It Up Tuesday. This dish sound delicious and I will be giving it a try. Just pinned it. Thanks for sharing. These look SOOO GOOD!!! Thanks for sharing at #throwbackthursday ! These look amazing! I’ve pinned them, and can’t wait to try them. Thank you for linking up to The Creative Exchange! Butter and Pork could it get any better? Thanks for bringing it to Cook it! Craft it! Share it! hope to see you back tomorrow! 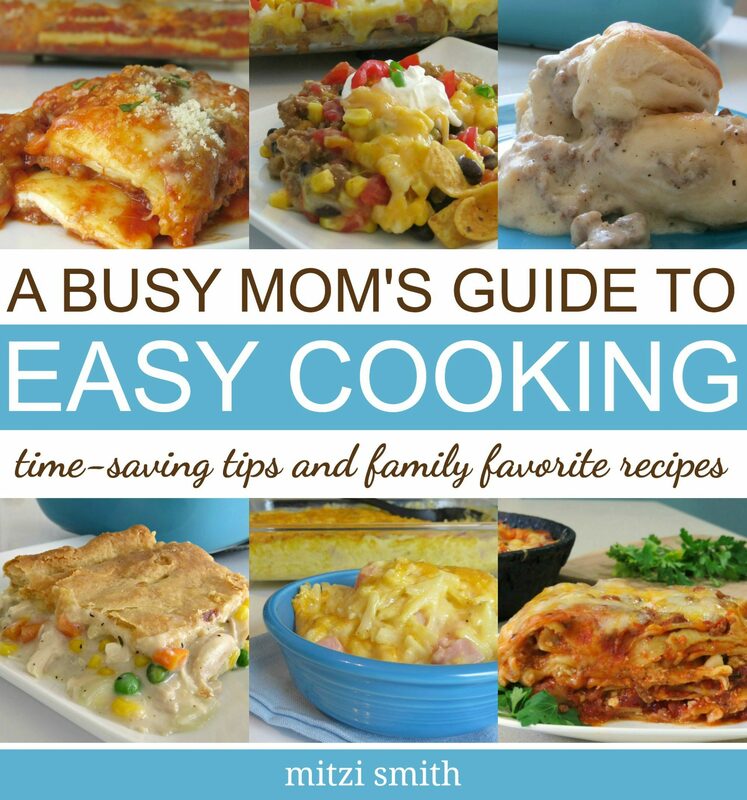 Mitzi, all your recipes look delicious! You’ve hooked me again and got a featured spot on Makeovers & Motherhood’s Welcome Party Wednesday Link-Up this week! Thank you for sharing! Wow! That looks awesome and yummy! I love this idea. I will have to see if I can do something like this for my kids since they love pork chops. Thanks for linking up!! I don’t eat pork much but this sounds so good I am tempted to break out the chops. These look incredible! 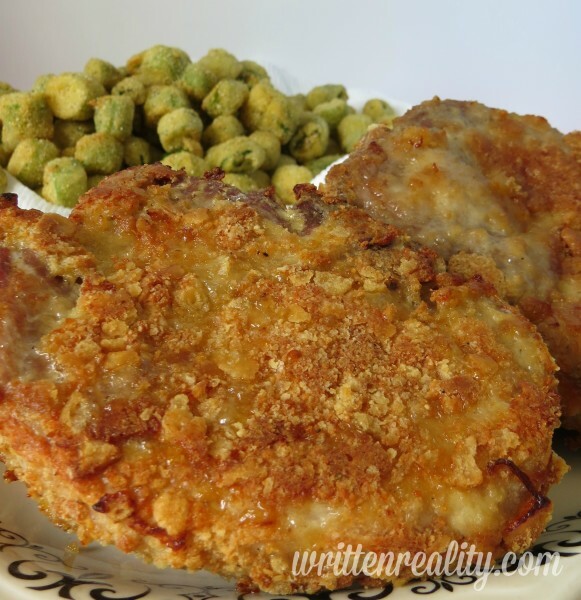 I love pork chops an am always on the lookout for new ways to make them! Thanks for sharing! What a great idea to use two pans. These sound wonderful, I can’t wait to make it. You know what, I never eat poke chops because I’d brefer bacon or sausage. But now I’m really tempted by this idea of adding the butter parmesan crust. Pinning it so I can give it a try! Totally pinned this! It sounds amazing! This look absolutely amazing. Pork chops are a tough one at my house but this might be perfect. This looks so good! Thanks for sharing it at Totally Terrific Tuesday this week! This recipe sounds delicious. I know my hubby would love it! Thanks for sharing at Merry Monday. This sounds wonderful & I have everything I need in the house to give this a try. Definitely trying this tomorrow night 🙂 Oh & I visited from Works for me & am so glad. Holy yum! These look amazing. Thanks for sharing on Merry Monday! We love pork chops, so I am always looking for ideas. This looks very nice. DO you think regular breadcrumbs or Panko will work instead of Ritz crackers? 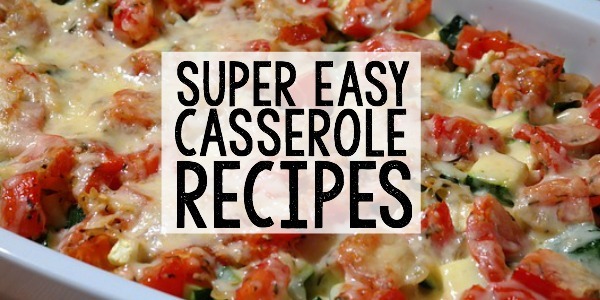 I’m sure you could use Panko or breadcrumbs. We just like Ritz because they have a buttered flavor. Thanks for the great recipe! 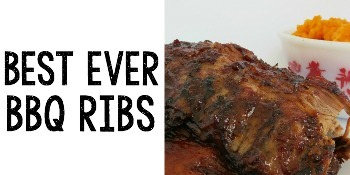 I’m always looking for new pork recipes since my husband prefers it over other meat. (I personally am not a fan…so I usually eat the side dishes…haha). Pinned it so I could find it later. I’m visiting from the Pretty Pintastic Link-Up! I’m not really a pork chop fan, but these look so good. I’ll definitely have to give them a try! Your Butter Crusted Parmesan Pork Chops would be fantastic! Hope you are having a fantastic week and thanks so much for sharing with Full Plate Thursday. This sounds so delicious! I lvoe pork chops but I always make them the same way. 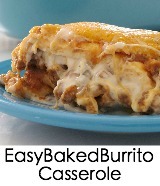 I cannot wait to try this recipe out! Sharing! Thanks for sharing at Totally Terrific Tuesday last week! Can’t wait to see what you have been working on this week! I miss pork chops. Pork gives me wicked migraines so I can’t have it anymore. These look so good! Yum!